The Bush Telegraph is a marvel of telecommunications technology. Click here to play! By utilizing what we like to refer to as 'bongos' in order to transmit complex messages through the air using what we like to call 'beats', bush creatures will be able to communicate with each other over distances of as much as 'How Far Can Walk Before Sundown'. Our operators are dedicated to ensuring the integrity of the Bush Telegraph system. On our most basic bongos, we have Blue Toucans, known for their expertise with such instruments. Our customer complaints department is headed by Orange Boars, the best of all bush creatures at goring unhappy customers. Finally, our high level Purple Possum service lets our business customers tell other creatures about a rotting wombat carcass ripe for eating in a matter of minutes using premium bongos. The latest wood and hide technology means our Purple Possums can transmit 100 grunts, clicks or hoots worth of communication per minute! 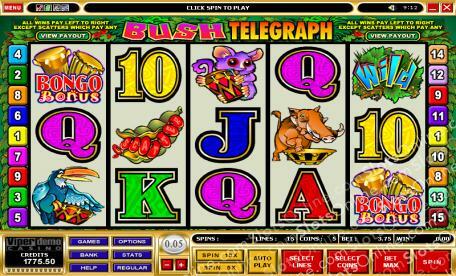 The Bush Telegraph still needs some work, but with your investment it could become the biggest business opportunity of this season. You could be rolling in seedpods and shiny things before you know it, just put some cash into the Bush Telegraph and start sending message to cute bush creatures today. Seedpod symbols act as scatter symbols, with 3, 4 or 5 Seedpods on the reels awarding 10 free spins at triple winnings. Also, scatter symbols pay out on the total bet. 2 win twice the bet, 3 win 4 times the bet, 4 win 50 times the bet, and 5 win 400 times the total bet. Wild Leaves symbols substitute for all symbols other than scatter and bonus symbols. When 3 or more Bonus Bongo symbols land on an active payline, the bonus is triggered. In it, the player chooses a number of bongos, each revealing a prize amount. The total amount is awarded as prize money.